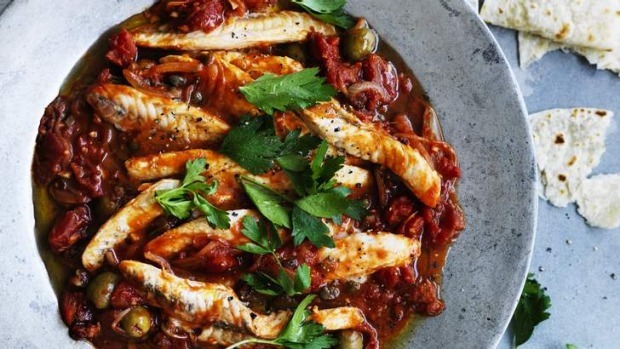 Veracruz sauce traditionally accompanies red snapper, but it works well with any white-fleshed fish. Serve with warmed tortillas, or peel and cook some potatoes separately and add them to the sauce before serving. 1. Sprinkle fillets with ½ tsp salt and place in a shallow dish. 2. Cut limes in half and squeeze juice all over fish. Place lime halves in dish with the fish, cover and leave to marinate in the refrigerator for one hour. 3. Heat oil in a large frypan over medium-low heat. Add onions and remaining salt and cook until golden, about 15 minutes. Add garlic, and cook for a further minute. 4. Add tomatoes and cook for 10 minutes. Add olives, capers, jalapeños, jalapeño juice, oregano and bay leaves. Season with salt and pepper and cook over a low heat for 20 minutes. 5. Add fish fillets and lime juice to the sauce. Cover and simmer gently for three minutes. Turn over fillets and cook for another three minutes. Remove from heat to rest for a few minutes, then discard bay leaves. 6. Season to taste, drizzle with olive oil, scatter with parsley and serve immediately. Suggestion: I like to serve a raw cabbage and cucumber salad with this and wrap it all up in a tortilla.